From India to Russia and China to Iran, there is a big question mark on the geopolitical condition of the region once the western forces from Afghanistan will depart sometime in 2014. Russia, China, India and the neighbouring states are eager to know America’s and NATO’s strategy after the withdrawal of the forces so that they can prepare themselves to deal with the coming situation. Each nation including Pakistan, has an objective in Afghanistan to safeguard their interest and maintain peace within the region. However, Pakistan differs from other countries in implementing its objectives in Afghanistan. Pakistan supports Taliban and believes in either Taliban rule in Afghanistan or a coalition of Afghan government with Taliban. It has also made western powers to consider Taliban to be reconciled and establish a power sharing arrangement in the Afghan government. It is believed that the U.S, along with the U.K, France and Germany, is trying to reach out to the Taliban leaders directly. Before the war on terror in Afghanistan there were only three countries: Pakistan, Saudi Arabia and the United Arab Emirates, who recognized Taliban. Now there is a good probability that in the coming future more countries are willing to recognize it. India sees Afghanistan as a strategically important country. According to India, Afghanistan is its bordering neighbour, however the part which borders Afghanistan is occupied by Pakistan which India doesn’t recognizes on its national maps. Safeguarding a Taliban free Afghanistan is in interest of India which is one of the favourite target of cross border terrorism. Indians have made over $2 billion of investment in Afghanistan mainly in mining, agriculture, energy, capacity building and infrastructure to make its place secured as a friendly nation. Just to make Afghanistan less dependent on Pakistan for access to the sea, India had been building a highway and rail link from Iranian ports to Afghanistan and Central Asia. India has been acting swift to prevent Pakistan from regaining Afghanistan as its backyard and making it a place to nourish extremism and drugs, taking the land locked country back to 1990s. If Pakistan can ensure its western border safe by having its puppet government in Afghanistan, it will be able to largely concentrate on its eastern border with India. India so far doesn’t have any declared interest of forming military bases in Afghanistan. Although India has deployed soldiers of Indo Tibetan Border Police in Afghanistan to ensure safety of Indian diplomats and development work in Afghanistan a big military presence in the land locked country in the future may help India to contain its childhood rival. China’s establishment in Afghanistan has largely been propelled by its all weather friend, Pakistan. Like India, China has managed to invest nearly $3 billion in Afghanistan. China believes presence of Taliban can affect its business development dreams in Afghanistan. One of the major concern in China is also the extremism in its Xinjiang province whose roots have been identified in Pakistan and Afghanistan. China doesn’t want to take risk of cross border backed development of unrest inside its territory. Specially on this matter, Chinese policy differs than that of Pakistan and for this reason earlier this year China approached India to discuss Afghanistan. India and China may be competitor in Afghanistan for securing tenders and deals, but to sustain there, they need the support of each other and a common ground of strategy. For India, it gives the interpretation that China doesn’t exactly buy Pakistan’s approach of solving Afghanistan’s situation which doesn’t want to exclude Taliban from Afghanistan. Presence of either Russia or United States in Afghanistan would be in favour of India. Although India maintains one air base in coordination with Russia in Tajikistan [Read: India Expanding Its Strategic Presence in Other Countries], India doesn’t see itself as a major military expansion power seeking oversea bases. 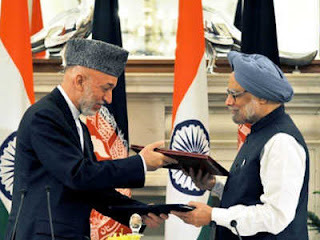 India aided the NATO and northern alliance in Afghanistan during the war against Taliban, and India was also the only country in South Asia to recognize the Soviet backed Democratic Republic of Afghanistan. At least as of now, India has no declared interest of setting up military bases in Afghanistan. India, on the other hand repeatedly rejected any attempts to reconcile the “good Taliban” within Afghanistan’s system. Afghanistan’s president Hamid Karzai had invited Pakistan’s government and ISI chiefs to take more active role in resolving Afghanistan’s issue, as it had been considered that any agreeable resolution of Afghanistan was impossible without the involvement of Pakistan in it. The assassination of former Afghan president Burhanuddin Rabbani in September 2011, which was traced to Taliban, changed everything. Afghanistan made a sudden geopolitical shift and signed strategic pact with India in October 2011 that includes training Afghanistan’s military. Russia and China, on the other hand are worried about west’s plan of supporting a government in Afghanistan in cooperation with Taliban. What they fear is that they believe it could become an America-Taliban deal allowing continued presence of America and breaking the future economic and geopolitics dreams of both Russia and China in Afghanistan. However, now the chances of America accepting Pakistan’s formula is low, as now it is clear that Osama bin Laden was hidden in Pakistan and there have been evidence of Pakistan’s ISI and Haqqani network involved against the Indian and American interests in Afghanistan. India, Russia and China met first time in Moscow on 20th February, 2013 to discuss the situation in Afghanistan. India has also been engaged with the U.S., U.K and Afghanistan for future cooperation. U.S and China are engaged in their own conversation on Afghanistan, and on the other hand India, Russia and China are also involving Iran. The amount of conversation and dialogue between high level diplomats of the countries shows the importance of Afghanistan and their future. Each country is racing to expand its influence over Afghanistan, but the main motive is same, to keep Taliban at bay.